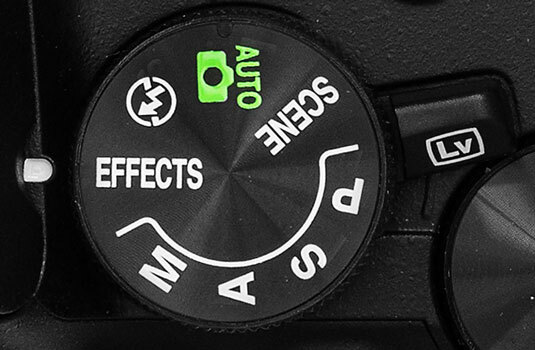 When you set the Mode dial on your Nikon D560 to Effects, as shown here, you can apply special effects on the fly. That is, the effect is added as the camera writes the picture to the memory card. For still photos, you might prefer to capture your originals sans effect and then work from the Retouch menu to alter them. That way, you wind up with one normal image and one with the effect applied, just in case you decide that you prefer the unaltered photo to the effects version. 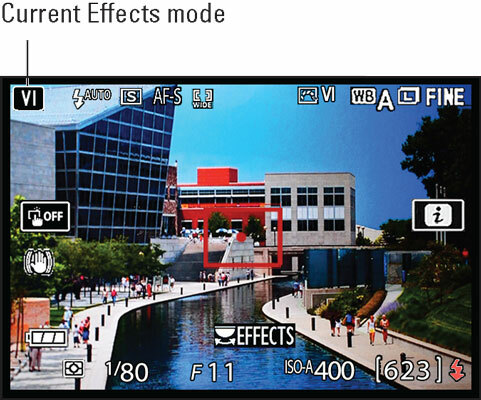 Shooting in Effects mode also brings up another problem: To create the effects, the camera puts most picture-taking controls, such as White Balance and Metering mode, off-limits. However, Effects mode does offer some artistic filters not available on the Retouch menu. In addition, it enables you to add effects to movies, which isn’t possible from the Retouch menu. The best way to take advantage of Effects mode is to turn on Live View (rotate the LV switch on the right edge of the Mode dial). You have to use Live View to shoot movies anyway, but it’s beneficial for still photography, too. Several effects offer settings you can tweak to alter the result, and you can get to those settings only in Live View mode. Live View also enables you to preview the selected effect. Set the camera to Live View mode to access Effects mode adjustments or to apply effects when recording movies. Tap that icon or rotate the Command dial to display the left screen shown in the following figure. A ribbon containing icons representing each effect appears near the top of the screen. To scroll through the available effects, tap the left/right touchscreen arrows on either side of the ribbon or rotate the Command dial. The preview updates each time you scroll to a new setting. Rotate the Command dial to scroll through available effects (left); the OK Set symbol tells you that you can adjust the impact of the effect (right). When you find an effect you like, press the shutter button halfway and release it to return to shooting mode. If an effect offers adjustments, tap the OK Set symbol or press the OK button to display a screen containing the adjustment controls. For example, the Photo Illustration effect offers the single control shown on the right. As you change the control setting, the preview updates to show how the new setting affects the image. Usually, you adjust options by moving a marker along a bar like the one shown in the figure. Press the Multi Selector right or left to make that happen. You can also tap the bar to place the marker at the spot you tap. 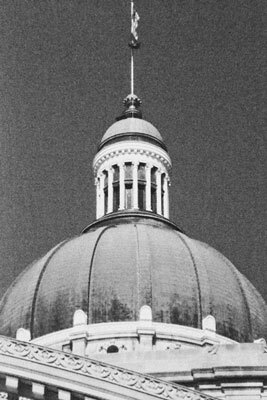 Night Vision: Use this setting in low-light situations to produce a grainy, black-and-white image like the one shown here. Autofocusing is available only in Live View mode. For viewfinder photography, you must focus manually. Flash is disabled, as is the AF-assist lamp. The whole idea is to create a picture taken in little light, after all. Use a tripod to avoid blur. A slow shutter speed is needed to capture the image in dark conditions, and you must be careful to avoid camera movement during the exposure. If your subject is moving, it can appear blurry even if the camera is on a tripod. You can capture the photo only in the JPEG format. You select this setting via the Image Quality option on the Shooting menu. Raw (NEF) files aren’t compatible with the Night Vision effect. Super Vivid: Choose this setting for hypersaturated, super-contrasty images. Pop: One step less intense than Super Vivid, this mode amps up saturation only. Photo Illustration: This setting produces a bright, poster-like effect. Autofocusing is not available during movie recording in this mode. Additionally, the resulting movie looks more like a slide show made up of still images than a standard movie. Toy Camera Effect: This mode, also compatible only with the JPEG Image Quality setting, is designed to create a photo or movie that looks like it was shot by a toy camera — specifically, the type of toy camera that produces images that have a vignette effect (corners of the scene appear darker than the rest of the image). In Live View mode, you can adjust two options: Vividness, which affects color intensity; and Vignetting, which controls the amount of vignetting. Miniature Effect: This one is also a duplicate of the one on the Retouch menu. Again, the filter works by blurring all but a small portion of the scene, which you specify by positioning the red focus frame that appears in Live View mode. To set up this effect, press OK or tap the OK icon to display horizontal markings that indicate the width of the sharp-focus region. Use the Multi Selector or touchscreen controls to adjust the width and position of the in-focus region. When you achieve the look you want, press or tap OK again. A few limitations apply: Flash is disabled, as is the AF-assist lamp. If you use the Continuous Release mode, the frames per second rate is reduced. You must set the Image Quality option (Shooting menu) to JPEG for still photography, and when autofocusing, you can’t use any AF-area mode except Single-point. Selective Color: Like the Selective Color filter on the Retouch menu, this effect enables you to desaturate (turn black and white) all but a few colors. And as with the Retouch menu filter, the Effects mode version is complex to use — even more so, in fact — and doesn’t give you enough control to precisely desaturate just the colors you want to alter. Instead, shoot the photo in a regular exposure mode and then create the effect in a photo-editing program that offers tools that make it easier to control which part of your photo is affected by the desaturation. 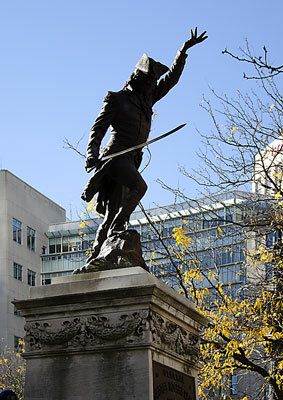 Silhouette: Choosing this setting ensures that backlit subjects will be captured as dark silhouettes against a bright background, as illustrated. To help ensure that the subject is dark, flash is disabled. The Silhouette effect can produce an interesting result when you photograph dark subjects set against a bright background. After selecting an effect, you can exit Live View to take the picture using the viewfinder if you prefer. Or, to record a movie, remain in Live View mode and press the red movie-record button on top of the camera to stop and start recording.